Provide comfort for the family of James Block with a meaningful gesture of sympathy. James Anderson Block, 97, of Simsbury, beloved husband of the late Marcia Block died on February 13, 2019 at St. Francis Hospital in Hartford with his loving family by his side. He was born at home in Norwich on October 14, 1921, the son of the late Walter and Mildred (Smith) Block. Jim volunteered for service in the US Navy at the outbreak of World War II. He bravely served in the Pacific as a Lieutenant aboard the USS LST 223 taking part in several landing operations including the Battle of Leyte. Upon returning from the war, Jim went back to school at the University of Massachusetts in Amherst and graduated in 1947 with a B.S. in Landscape Architecture. It was there where he met Marcia who he married in 1948. They settled in Simsbury in 1950 where they spent the rest of their lives. Jim was active as a professional Landscape Architect and Land Planner since 1948, having served as vice president of the firm Yarwood and Block for 30 years and subsequently as a partner in the firm of Brown and Block Associates for 10 years. He was a member of the First Church of Christ in Simsbury for more than 50 years, serving on numerous boards and designing the Memorial Garden. Jim was an avid reader, he enjoyed taking walks with Marcia, vacationing on Cape Cod, sailing in his boat 'Sloopy" and listening to the Red Sox on the radio. He was a great letter writer and many of his friends cherished those letters over the years. 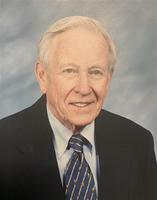 Jim, also known as "Newt", loved to laugh and spend time with his grandchildren. He was kind to all, always a true gentleman and will be missed and remembered by family and friends alike. Jim wrote on his last Christmas card "Good memories are God-given gifts that last forever". Jim was predeceased by his wife, Marcia, his son, Thomas Block, his brother, Walter Block and a sister, Lucille Driesch. He is survived by his son Jonathan Block and his wife Emily of Fishers, IN; and his daughter Jane Preskenis and her husband Dr. William Preskenis of West Simsbury; grandchildren, Christina Martin and her husband Greg, Peter Block, Daniel Block, Kirsten Preskenis and her husband Nick Cinea, Bill Preskenis and Tim Preskenis; great grandsons, Henry, James, and William Martin and a sister, Betty Burke of Sandwich, MA. A memorial service will be celebrated Saturday, March 23rd at 1:00 PM at the First Church of Christ, 689 Hopmeadow St., Simsbury, CT. In lieu of flowers, donations may be made to the Memorial Garden Fund at the First Church of Christ Simsbury. Vincent Funeral Home of Simsbury is caring for the arrangements. Please visit Jim's "Book of Memories" at for online condolences. Provide comfort for the family of James Anderson Block by sending flowers. I was introduced to Jim a few years ago after I retired. We both shared a keen interest in the Bible and spent many mornings discussing the deep things contained therein. Jim cherished life, but he wasn’t fearful of death. He was grateful for the long and fruitful life that Jehovah had given him. Jim loved his family and friends. He spoke affectionately of his beloved wife “Marsh” and expressed the hope of their reuniting in the future. I believe that the Bible’s description of death as a sleep-like state (Ecclesiastes 9:5) and the promise of a future resurrection (Acts 24:15) was a source of great hope and comfort for Jim. During my visits with Jim, I was struck by the numerous family photos and mementos in his home. It indicated to me just how much he valued his family relationships. Sadly, many of our elders today are isolated from family and friends. Happily, Jim did not suffer this. It was apparent to me that there was loving support between him and his family, support that allowed him to stay meaningfully connected to them while continuing to live with dignity and relative independence in his home. Realization of this should be a great source of satisfaction for Jim’s family. As I got to know Jim, I was impressed by his interest in others, his humility, and his sense of humor. He would always ask how I, my wife Susan, and my children were doing. (His ability to remember names was impressive!) I deeply appreciated those expressions of sincere interest. He viewed others superior to himself, a beautiful Christian quality. And Jim had a wonderful sense of humor. There’s an old adage: “He who laughs, lasts!” Maybe Jim’s longevity was due in some measure to this endearing quality of his. I remember laughing often with Jim. Jim was a good friend. It was a privilege to know him.